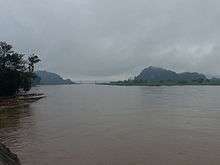 Hpa-An (Burmese: ဘားအံမြို့; MLCTS: bha: am mrui. [pʰə ʔàɴ mjo̰]; also spelled Pa-An) is the capital of Kayin State (also known as Karen State), Myanmar (Burma). 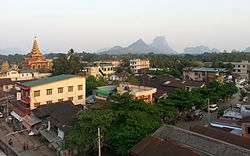 The population of Hpa-An as of the 2014 census is 421,575. 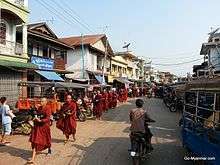 Most of the people in Hpa-An are of the Karen ethnic group. Kayin State Cultural Museum is located in Hpa-An.The Zwegabin Hill is an attractive place for visitors. Kyaukkalatt (Kyauk Kalat Monastery) and Kawtgon Cave (or Kawgoon Cave) is also a place of interest. Zwegabin United FC founded in 2010, is based in Hpa-An.The club is competing in Myanmar National League. ↑ "Hpa-An Climate Normals 1961-1990". National Oceanic and Atmospheric Administration. Retrieved January 12, 2013.